Soldiers' Redemption (First Cohort Book 1) by M. R. Anthony. Captain Tyrus Charing and the men of the First Cohort have fought on the wrong side for as long as they can remember. They have travelled from one battle to the next at the bidding of the cruel Duke Warmont, fighting endlessly for a man they despise. Now they want something different. They want to fight for the right people and for a deserving cause. There is hope for Captain Charing and his men – a saviour has come and she needs good, loyal soldiers in order to overthrow the Duke. As the First Cohort try to pay for the sins of their past, they discover they’ve taken on far more than they could have imagined. They are unbeaten in battle, but the Duke does not care how many die, so long as he stays in power. Amongst his generals are sorcerers of great power, and an inhuman brute of callous evil, all of whom are eager to face Charing’s men. 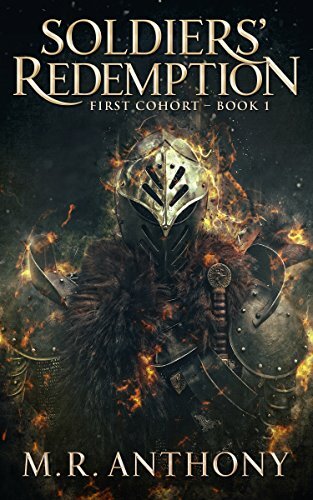 Soldiers’ Redemption is a brutal and gritty fantasy epic, about strength, bravery and an unwavering determination to beat the odds. I like tales of redemption and characters finding hope after despair, and so this book instantly drew me in. The story follows Captain Tyrus as he commands a group of 500 odd soldiers. They are called the First Cohort and are famed and feared in equal measures. They serve a tyrant called Duke Warmont, and after so long tire, from the endless killing, but they find redemption in the most unlikeliest of circumstances - a young woman, who becomes their saviour. I found the book very well written and the words flowed nicely. The author did a great job capturing the description, particularly the fighting scenes, which often reminded me of Roman military but thankfully less convoluted. Captain Tyrus was a fascinating character, and shrouded in a little bit of mystery. The book was told from his point of view and you got a real sense of the conflict swirling in his mind and the sense of shame and regret of his past, but also the hope to be a better man. I admired the rapport he had with his men, it was natural and infused with leadership, and I couldn't help but like the character. I was also initially confused with the start of the novel as the story seemed to be told midway through and a good chunk of information missed, eventually after reading a few chapters, I did manage to put the pieces together to form a more clearer picture. For those who like a tale of redemption and a main character who is not simplistic but more profound in personality, will enjoy this book. Overall - even though the book fizzles out slightly near the end - I thought this book holds a lot of promise and I will be reading the sequel.